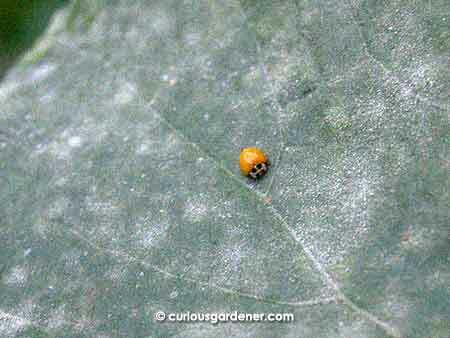 They come as a set, powdery mildew and the yellow ladybug. My marrow plant is the worst hit, where powdery mildew is concerned. The vine is just too dense, with insufficient air circulation that, together with dampness, powdery mildew thrives in. And since there’s an abundance of powdery mildew, no thanks to the wet weather at this time of year, there’s been an increase in the numbers of the little yellow ladybugs. 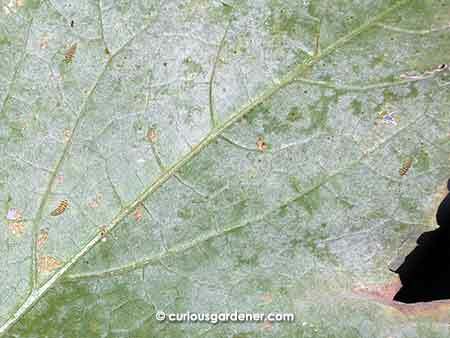 Can you spot the three yellow ladybug larvae on the underside of the marrow leaf? 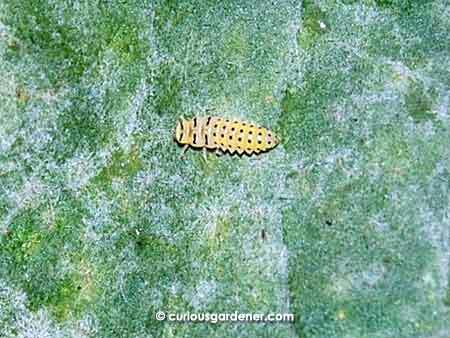 Here’s a closer look at the yellow ladybug larva, feasting on powdery mildew. It looks like they feed on it at all life stages! I don’t mind, because I think they’re cute, in addition to useful in eating up the mildew. However, unlike their red cousins and aphids, you don’t see as great a decrease in mildew as you would aphids. 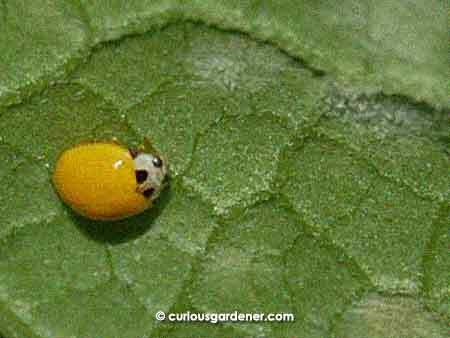 The marrow plant isn’t the only one sporting yellow ladybugs – this one was among the few we noticed on the angled loofah plants, too. 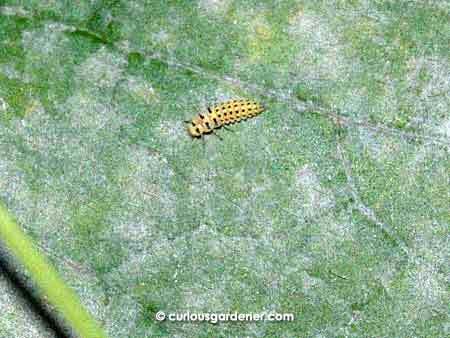 I did some pruning of the worst mildewed leaves on the plants last weekend, but realized there were either larvae, ladybugs or cocoons on several of the leaves. Since it wasn’t in me to be so heartless to just throw the creatures away, I first scrutinized the leaves before removing the unoccupied, most heavily mildewed leaves. I think I’ve got too much of my dad’s soft-heartedness… More pruning will be done, though – carefully. © 2013 curiousgardener.com All rights reserved.